“GINZA×CSR” Vol. 30 will introduce ITOYA, a long-established store specializing in stationery. Since its establishment in 1904 (Meiji 37), ITOYA has played the role of a cultural center through selling stationery. 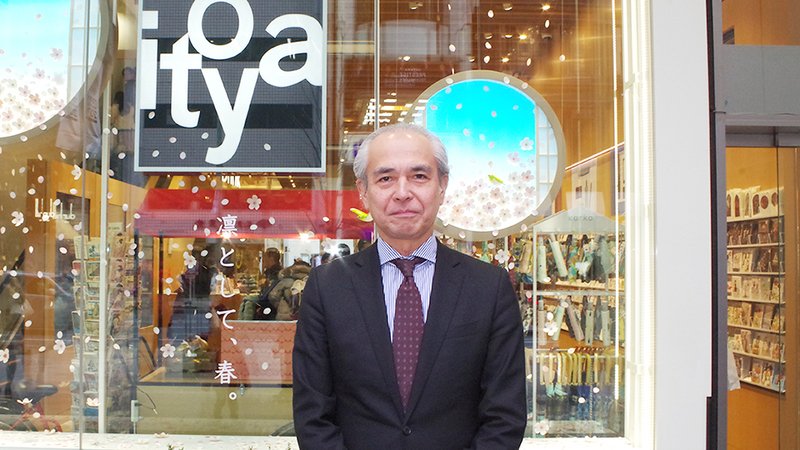 In 2015, the Ginza Main Store restarted as G.Itoya, continuing to communicate novel values beyond the conventional image of a “stationery store.” Curious to learn about the passion driving the company their new endeavors, we interviewed Mr. Hiroyuki Miyasaka, General Manager of Itoya Co., Ltd. Ginza Main Store. From a place to “buy” to a place to “be.” A new world of stationery presented by G.Itoya. ─Since your establishment in 1904 (Meiji 37), you have contributed to Japan’s cultural development through selling stationery in Ginza. This year we will celebrate 115 years of business. The role of stationery has evolved with the changing times. Stationery used to be bought as a “daily necessity” but now it is a “personal object” selected according to one’s liking. I believe that stationery is basically something you write with or write on. People have become more interested in “where they buy, what they use and how they buy” stationery. In times when stationery can be bought on the Internet, I am constantly conscious of the significance of purchasing stationery in Ginza at ITOYA and what would make the shopping experience exclusive to ITOYA or Ginza. ─The Ginza Main Store, which reopened in June 2015 after reconstruction is indeed symbolic of ITOYA and Ginza. When we renovated, our aim was to transform ourselves from the conventional store where people come just for the purpose of shopping to an establishment where people can spend time experiencing various activities. We tried to design each floor so that we could offer our customers a relaxed and comfortable time. On the first floor, we sell lemonade made from an original recipe so that customers can walk around the store sipping lemonade. Most stores in Japan restrict eating and drinking, but since this style of shopping is seen in many other countries, we decided to adopt it at the Ginza Main Store. We were initially concerned that our merchandise might be ruined and the store might become messy, but no such problems have occurred so far and we have found that our customers enjoy this new style. On the second floor, we have an area for writing letters. We lend fountain pens and other writing instruments. It is a good opportunity for those who have never used a fountain pen to try writing with one. We have a post box inside the store so that letters can be posted before leaving the store. We also carry stamps that are exclusively sold at our store. I think many of us used to write letters in our own room or at the office, but my idea is to offer a place where people want to come to write their letters. On the fifth floor, we have created Nomad’s Nook, an area targeting remote workers. Stationery was mostly used inside, in the study or workplace, but working styles have become diversified with the times and many people take their tablets with them to do work outside. Stationery has come to be used on the move. On this floor, we have gathered attractive items, including rucksacks and rain shoes, to be used for work. On the eleventh floor we have a vegetable factory, where we hydroponically cultivate vegetables, which are served at the café on the twelfth floor. You can come here for tea or to have a meal in a relaxed atmosphere. ─ You have definitely created a space that goes far beyond the conventional image of a stationery store. My constant wish is to make this store a place where people can hit upon novel ideas just walking around. We started discussing what kind of place we would create three years before we renovated this building four years ago. I must say we surprised ourselves when we reopened, and our customers were even more astonished at how changed we were. Then, we spent one year making adjustments to reflect comments received from our customers as well as what we noticed along the way. That is how we reached where we stand now. It took much courage to build a completely new building, but if we hadn’t restarted from scrap, I don’t think we would ever have had these new ideas. Therefore, it is important to both pass on traditions and to take on new challenges. ─ You have hosted many different type of events, as well. ─ As you evolve with the time, what is something that you unchangingly value? We would like to be a place where people come not because ”ITOYA has everything” but because “ITOYA’s selection of products is reliable.” That is why we have a Pen Care Room in our fine writing instruments corner to offer repair and adjustment services, so that our customers can use their favorite items for a a long period of time. ─ Using our favorite items with care, for the longest time. You have certainly passed down the ecological spirit of your founders. Many visitors come from overseas looking for the symbolic red paper clip. When we reopened the Ginza Main Store in 2015, we made a brochure containing our vision, mission and values to distribute to our corporate customers and employees. In addition to our vision and values, it introduces the world we seek to create and the story of our founding. We encourage new employees and part-time workers to read it aloud together and return to it whenever something happens. ─ I am impressed that you have your employees read it aloud. ─ Before we close, please tell me about your special feelings for Ginza. I believe that we have been able to come this far, sailing through changing times, only because we are located in Ginza. We are not only determined to maintain the quality of our product, but seek to create a place where different people can come together, by making our store a comfortable place for everyone. Joined Itoya Co., Ltd. in 1984. For ten years, he covered corporate customers in the Out-of-Store Sales Department. After becoming the Store Manager of the Tamagawa Store in the Tamagawa Takashimaya Shopping Center, he became a buyer and manager of the Merchandise Department and later, as General Manager of the New Business Development Department, he opened Itoya’s first store in the Kansai area. He has also been engaged in launching collaborations with United Arrows (closed) and Tully’s Coffee, and opening airport stores and franchise stores. He assumed his current position in 2016.